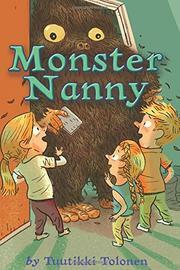 Magical nannies, pig nannies, mixed-up nannies—sure…but monster nannies? Halley, Koby, and Mimi’s mother has won a spa trip to Lapland. Dad (or Invisible Voice, as the kids call him, since he’s always traveling for work) won’t be home to care for the kids. A nanny has been promised as part of the package; when it arrives, the white family is surprised. It’s a huge, half-human, hairy, dirty, dust-covered monster. It seems nice enough, though. Mom goes on her trip, and the monster installs itself in the tiny hall closet. Halley brings home a book from the library about monsters, and the trio researches the uncommunicative caregiver. Seems monsters eat no meat and can be trained to understand humans and do simple tasks. Halley, Koby, and Mimi name their monster Grah. Reading on, they discover that monsters are social creatures. Observing both that Grah seems sad and that other kids are being tended by monster nannies while their parents are in Lapland, the kids hatch a plan to get all their monster nannies to their monster home, but there are other, more inimical magical creatures afoot. Finnish author Tolonen’s tale leaves many unanswered questions (why does Mimi’s bathrobe talk?) and relies too heavily on the monster book for exposition. A cultural detail or two might need explaining, but this may serve as a diverting and different read-aloud.